The Feast of San Gennaro Los Angeles is an Italian Festival that takes place every September in the heart of Hollywood. New Yorkers are long familiar with Little Italy's Feast of San Gennaro celebrated since the 1920s on Mulberry Street in New York. This 10-day festival dedicated to the Catholic Saint Gennaro, martyred in 305 AD, is so beloved by New Yorkers that transplanted New York Italians recreated the Feast of San Gennaro in Los Angeles in 2002. 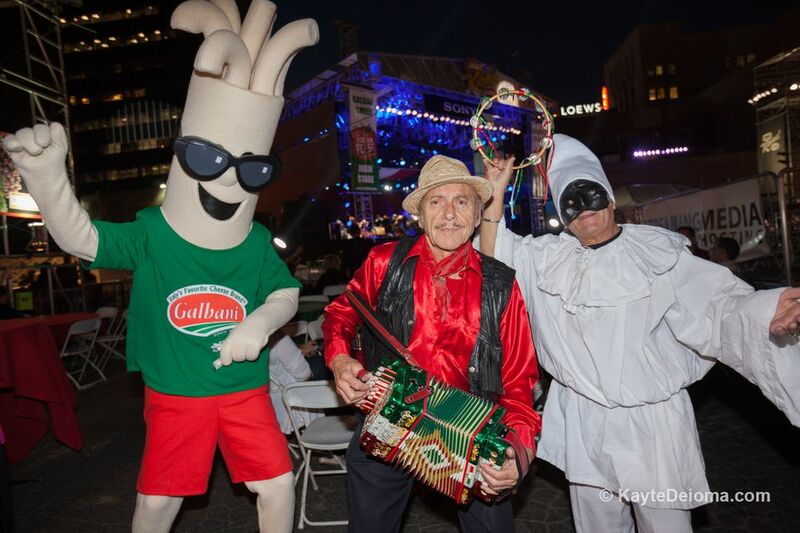 Although it lasts only three days instead of 10 and it's missing the traditional Cannoli Eating Contest, the west coast festival celebrating the venerable patron saint of Naples has plenty of Italian music, food and culture including an annual sauce/gravy competition. Location: Highland and Hawthorne, one block south of Hollywood Blvd next to Hollywood High School. Entrances at Highland and at Orange. Parking: Hollywood & Highland Center, enter off Highland north of Hollywood Blvd. $2 for 2 hours with validation from Hollywood & Highland shops or Visitor Center (NOTE: The festival cannot validate parking), $1 for each 15 minutes thereafter up to $13 maximum. $10 valet underground parking at Madame Tussauds. Rates at other surrounding lots vary. Festival music includes Italian, Italian American and guest artists, performing standards like Volare and That's Amore alternating with tenors singing Nessun Dorma and O Sole Mio, interspersed with Italian folk music, rock bands, swing bands and accordion players. Another highlight is the San Gennaro Procession, where community members and clergy parade the bust of San Gennaro around the block past the Chinese Theatre and back to the festival stage. It is followed by Mass on the Main Stage. Everyone is welcome to join in or watch the procession. Jimmy Kimmel (whose mom is Italian), Doug DeLuca, Co-Executive Producer of Jimmy Kimmel Live!, and a group of notable Italian Americans from New York organized the first Feast of San Gennaro in Hollywood in a parking lot across from the Capitol Records building in 2002. Since this is Hollywood, it's not surprising that Italian American celebrities like Tony Danza, Tommy Lasorda, Dom DeLuise, Joe Mantegna, Tony Orlando, Deana Martin and Gianni Russo have all been involved in the event. The Feast was so successful, it moved in 2004 to a larger venue filling the street behind the Grove shopping complex near the Los Angeles Farmers Market. In 2006 it returned to Hollywood to Highland and Hawthorne just a block south of Hollywood Blvd, closing off the entire street. This is next to Hollywood High School on the block behind the Disney Entertainment Center where Jimmy Kimmel Live! is taped. The space is double the size they had at the Grove and the festival has at times included events inside the Hollywood High School Auditorium next door. Since 2014 the footprint has been reduced somewhat due to budget constraints, but it's still just south of Hollywood and Highland.